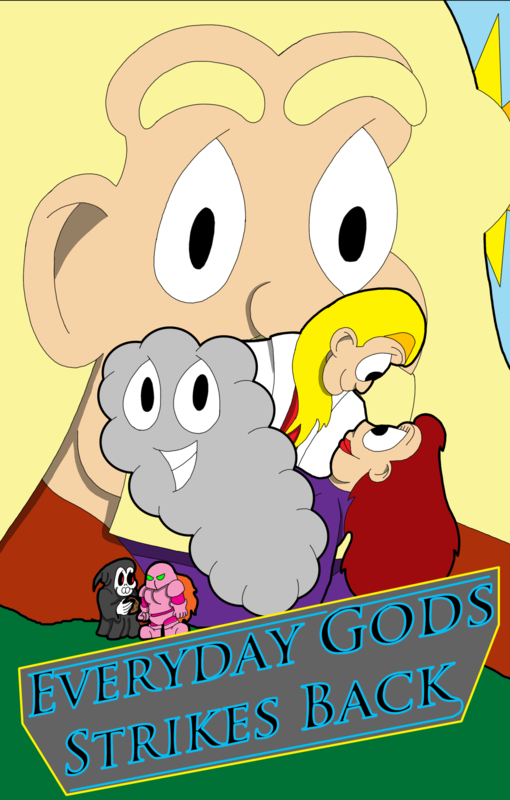 That’s right, Everyday Gods is returning. “Yeah, well where were you?” I can hear you asking. That is a long explanation, and it is filled with me complaining about life the universe and everything. Now my life hasn’t been all bad, not by a long shot, but it has not been all a bed of roses either. Suffice to say I have been very busy taking care of a great many things, and unfortunately Everyday Gods got pushed to a back burner. I will not bore you with details, if you want them for some reason feel free to contact me via e-mail (everydaygods@gmail.com) and I will be happy to converse with people. However, on to the important and fun things. As I stated Everyday Gods is returning. On March 19th, the 6th anniversary of the comic, I will begin posting new comics once again. At first I am only going to be posting once a week, so as to make sure I do not promise one thing and end up not being able to do it. So every Monday there will be a new comic. Once I am sure that I can keep my schedule, I will up it to two days a week, and eventually three days once again. If you are a fan of the other comic I worked on, “World Wide News” that should also be returning sometime in the near future. Luckily I can say I am not the only one to blame for that one going on hiatus. Cory!! Strode, the writer of the comic has also had a rollercoaster of a life lately and has just been able to get back to the computer to start writing again. Hopefully we’ll have scripts and new art soon. In other news, I just turned in my acceptance to be a guest creator at Springcon once again. I am looking forward to being there, and seeing all of the great volunteers and attendees. It is always a blast to be there. This year I also will be unveiling a new project that I have been working on as well. (This would be one of the good things.) At my day job, I have had a lot of time to doodle, but couldn’t of course set up my full computer, so as well as writing new scripts for Everyday Gods, I was able to start some initial sketches of a project I have wanted to start for years. And the ideas just flowed. So as long as the final steps go correctly, I will have something altogether new for Springcon. Later in the year I hope to have another secret project ready to release. My goal is to have it done for CONvergence. So all in all, make sure you are here for Everyday Gods, beginning on March 19th, and keep an eye out for more news on these top secret projects.